Michael O. Leavitt is an American politician and a member of The Church of Jesus Christ of Latter-day Saints, sometimes casually called the Mormon Church. 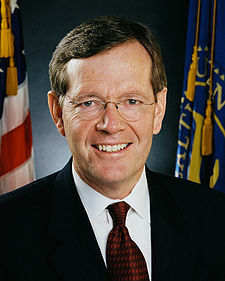 He served as the U.S. Secretary of Health and Human Services from 2005 to 2009, and as Administrator of the Environmental Protection Agency from 2003 to 2005. He was the 14th Governor of Utah from 1993 to 2003. Mike Leavitt was born on February 11, 1951, in Cedar City, Utah, to Dixie Lorraine and Phyllis Anne Okerlund Leavitt. He graduated from Southern Utah University with a bachelor's degree in economics and business. He is married to Jacalyn Smith and they have five children, four sons and one daughter. Leavitt is descended both from American colonial and Mormon pioneer stock. His ancestor Thomas Dudley was the second colonial governor of Massachusetts. Dudley's descendant, Dudley Leavitt was a Mormon pioneer. n 1976, Leavitt assisted his father, then a state senator, in an unsuccessful campaign for governor. He worked on a number of U.S. Senate campaigns through the 1980s for Jake Garn and Orrin Hatch. Leavitt first ran for governor of Utah in 1992. Though he had to come from behind in the Republican primary, he defeated the Democratic candidate, Stewart Hanson, and became the 14th governor of Utah, an office he held for three terms. Leavitt has been Utah's only three-term governor. During his eleven years as Governor, Utah was recognized six times as one of America’s best managed states. Leavitt was chosen by his peers as Chairman of the National Governors Association, Western Governors Association, and Republican Governors Association. In 1997, while serving as Utah governor, Leavitt helped to found an online university, Western Governors University. Nineteen governors signed legislation creating the school as a non-profit private university. Because of the perceived threat of the avian flu, Leavitt mobilized the nation’s pandemic preparedness and reconfigured the nation’s medical emergency plans. He also implemented the Medicare prescription drug benefit, worked toward transparency of price and quality in health, and developed a new national strategy for safety of imported products. Leavitt also served on the Homeland Security Advisory Council. Leavitt has created The Leavitt Partners to consult firms in the private sector and help them understand the federal regulatory bureaucracy regarding health and food safety. In the year 2000, Leavitt and his family formalized their philanthropic efforts by creating the Dixie and Anne Leavitt Foundation. The Leavitt's have donated over $9 million to the foundation. The foundation's principal beneficiaries have been Southern Utah University and The Church of Jesus Christ of Latter-day Saints. Other beneficiaries have included arts, educational and humanitarian organizations, including the Leavitt family genealogical society. Mike Leavitt has not been directly involved in the foundation's operations. This page was last edited on 12 September 2011, at 18:18.